Christians throughout history have used art to communicate theology. Most paintings are rather straightforward in their depiction of a gospel scene. But the scene of the resurrection of Jesus is an enigma. The miracle of Jesus’ resurrection was not directly described in the Bible. We see the results of the resurrection, but no one witnessed the actual resurrection of Jesus’s corpse inside the grave. So then, how did early Christians portray the resurrection in art? 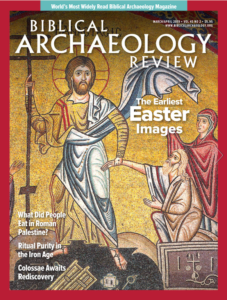 John Dominic Crossan and Susan Sexton Crossan address this question in the recent cover article of Biblical Archeology Review, “Resurrection Easter: Hunting for the Original Resurrection Image.” They claim, “Christianity eventually produced two direct depictions of the Resurrection moment (Easter), and they are utterly different from one another.” By the year 1000 AD, both traditions were fairly fixed in their portrayal of the resurrection. The western Church developed the Individual Resurrection in which Jesus rises alone. The focus of the scene is the empty tomb and Jesus rising from the dead in triumph. The eastern Church developed the Universal Resurrection. Here, Jesus raises triumphant from death/Hades and leads humanity up from the grave. The eastern Church’s Universal Resurrection has clear honor-shame elements. In terms of its theology of the resurrection, the eastern (Greek) Church highlighted honor-shame more than the western (Latin) Church. First, the eastern image of Anastasis (Greek, resurrection) portrays a collectivistic victory. Jesus pulls Adam and Eve, representatives of Humanity, up out of the grave. Old Testament figures David and Solomon watch and participate from the right side. In some depictions, more saints stand with Adam and Eve. Jesus rises with the saints. Second, the Anastasis scene symbolizes the restoration of status. Creation is put back into place. The divine hierarchy gets restored. Jesus raises humanity. In the image, Jesus grabs Adam by the wrist to indicate how humans completely rely upon God. Moreover, Jesus puts down God’s enemies. Death is broken and destroyed. 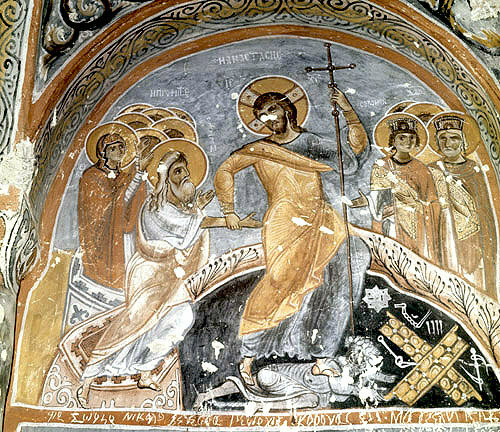 Jesus steps on the head of Hades. Death fails to hold Adam down. Humanity, once a slave under the rule of sin and death, now rises above them with Christ. The resurrection redraws the social hierarchy. Such status reversal is a common motif of biblical salvation. So, which image better conforms to the New Testament picture of Jesus’ resurrection? Crossan and Crossan suggest the eastern image of universal resurrection seems closer to the biblical vision of Jesus’ resurrection. Matthew 27:53 says “many bodies of the saints who had fallen asleep were raised.” In 1 Cor 15, Paul portrays the resurrection as a collective event. In the Old Testament, the resurrection of the dead is a revival of all God’s people, not a special favor for just one person. Paul also says, “we have been raised with Christ” (Col 3:1; cf. Eph 2:6). The resurrection is the collectivistic restoration of humanity to glory.